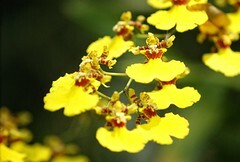 When people think about Oncidium orchids, sprays of little yellow dancing ladies come to their minds. These flowers have out-of-proportionally big lips that look like the skirt of evening gowns. When hundreds of them are on a single spike, it’s like the celebration of a festival. But the dancing ladies orchid is only one of the diverse Oncidium orchids. In fact, with 600 species, you can find Oncidium from sea level all the way to 13,300 feet (4000 meter) high throughout the American tropics, from Florida to Argentina. Their flowers come in yellow, brown, white, red, pink and a combination of these colors. 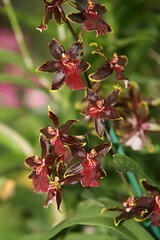 There are many lovely hybrids made within the Oncidium species and with other closely related genera. The closely related genera are usually referred as “Oncidium Alliance,” which include Miltonia, Odontoglossum, Brassia, Cochlioda and Comparettia. Intergeneric hybrids are more tolerant of a wider range of growing condition, making them excellent for beginning orchid growers. Miltonia. It has long spikes with as many as 40 yellow, red and white flowers that are about 2.5 inches (5 cm) across and can last up to 10 weeks. If properly cared for, the Wildcat will bloom three times a year! Another recommendation is Oncidium Sherry Baby. It also has long spikes with many small red and white blooms that can fill the room with an intoxicating chocolate scent. This easy orchid can bloom 2 to 3 times a year, making it an extremely popular orchids among orchid aficionados. 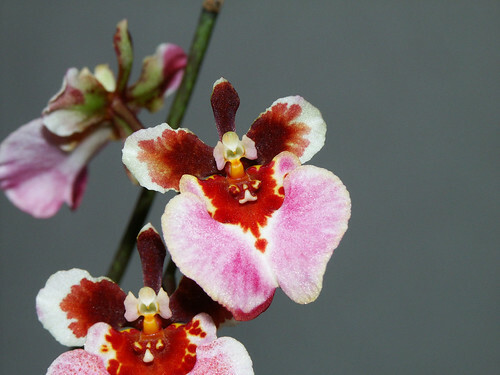 Oncidium orchids demand intermediate temperature and light level. You can grow them by a window facing anywhere except north. Under the skylight is also a good location. Provide them day temperature of 65–75°F (18-24°C) during the day and 55–65°F (13-18°C). You should water them year round, but make sure that they get sufficiently dry before watering them again because they don’t like to be wet all the time. If your growing area does not have 50-60% humidity, increase it by putting your oncidium orchids on a humidity tray. The leaves of oncidium tend to get black spots easily, so ensure that your growing area has enough air movement to keep these little spots under control. Even though many growers still refer them as Equitant Oncidiums, these orchids now have the genus of their very own called Tolumnia. Tolumnia’s leaves are very different from those of Oncidium. These fan-like leaves are fleshy and mostly dark reddish green. If you use a knife to cut one across (not that I will actually cut my beloved orchid! ), the cross-section is triangular. Tolumnia orchids are small plants with long spikes coming from the base of the plant. On each spike, you can find multiple small flowers that indeed resemble Oncidium dancing lady flowers. Coming from the Caribbeans, Tolumnias are like warm weather with high humidity. They detest sitting in wet potting material so excellent drainage is the key to the success of growing these orchids. If you live in a high humidity area or if you have time to mist your Tolumnia frequently, mounting it on a branch or a slab is a good idea. Since I live in South California with desert-like weather, mine are not happy being mounted. Therefore, I grow mine in a shallow clay pot with mostly charcoal and perlite with just a touch of bark to retain some moisture. Grow your Tolumnia in medium light. They can even take a period of direct sunlight if your humidity is high enough. Water your mounted Tolumnia everyday and your potted ones every 2 to 3 days in the summer or 1 to 2 weeks in the winter.